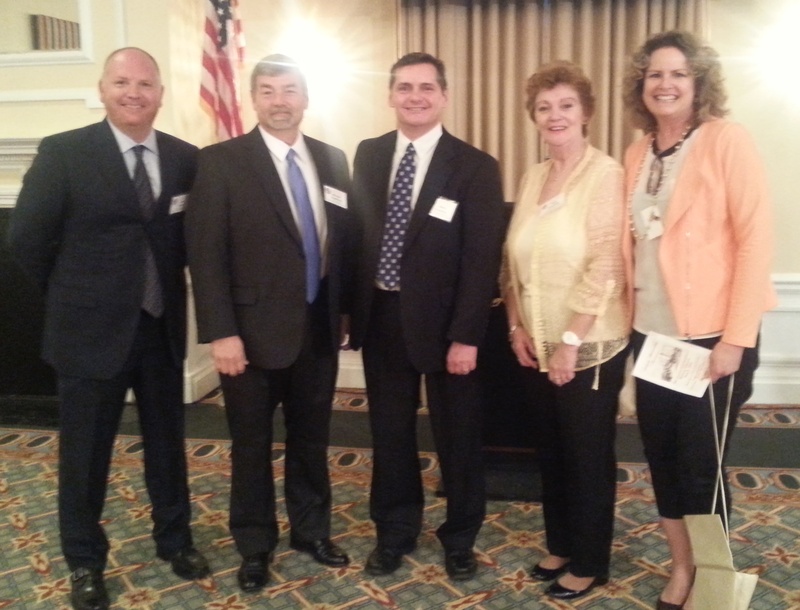 Hi all: John Elliot and I have been research partners for four years. We’ve developed a great friendship and thoroughly enjoyed working together making discoveries and sharing them with you. Our main goal for partnering was to produce a book about the incarceration and punishments of the Lincoln conspirators called “Inside the Walls: The Final Days of the Lincoln Conspirators”. Due to heavy work schedules, for the most part, the book was just not getting done. So we have decided to make a change that will allow for the project to come to fruition. The following announcement will explain the details. John will post the same on his Facebook page “Inside the Walls”. After several years of enjoying a successful research venture together, John and Barry have agreed to dissolve their partnership and pursue individual interests. 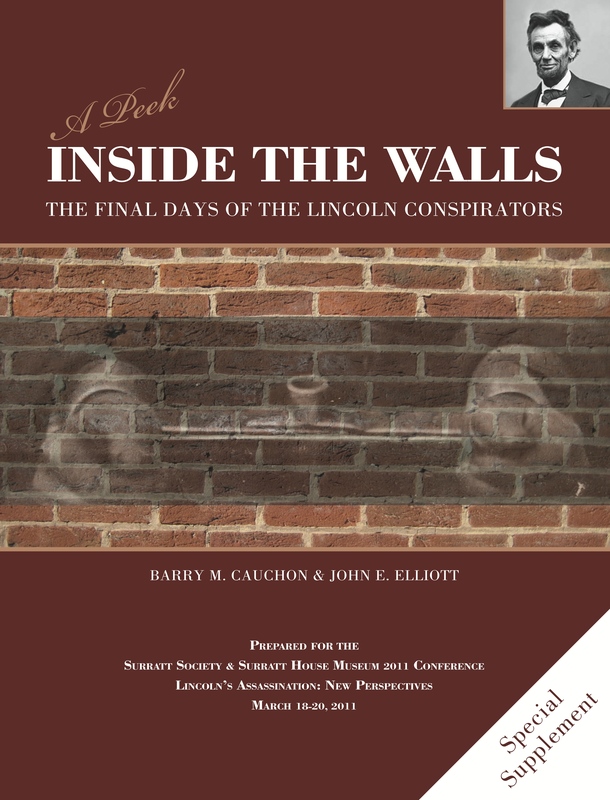 Largely due to Barry’s work schedule, the goal of writing and publishing Inside the Walls: The Final Days of the Lincoln Conspirators became a difficult task to manage. After a short period of discussion, the two mutually agreed on a plan. Moving forward John will take complete ownership of the book Inside the Walls: The Final Days of the Lincoln Conspirators, writing it himself. Barry will concentrate on writing and publishing smaller independent supplements as time permits. John will also take full ownership of the name Inside the Walls, the Facebook page and the website (currently under construction). John and Barry will continue to share their common interests, maintain their friendship, and look forward to ongoing associations with the research community, which has been so kind and welcoming. Our heartfelt appreciation goes out to all of you for having supported our mutual endeavors. Killing Lincoln: a National Geographic two-hour documentary – Fact or Fiction? KILLING LINCOLN was aired for the first time on February 17, 2013 on the National Geographic channel. 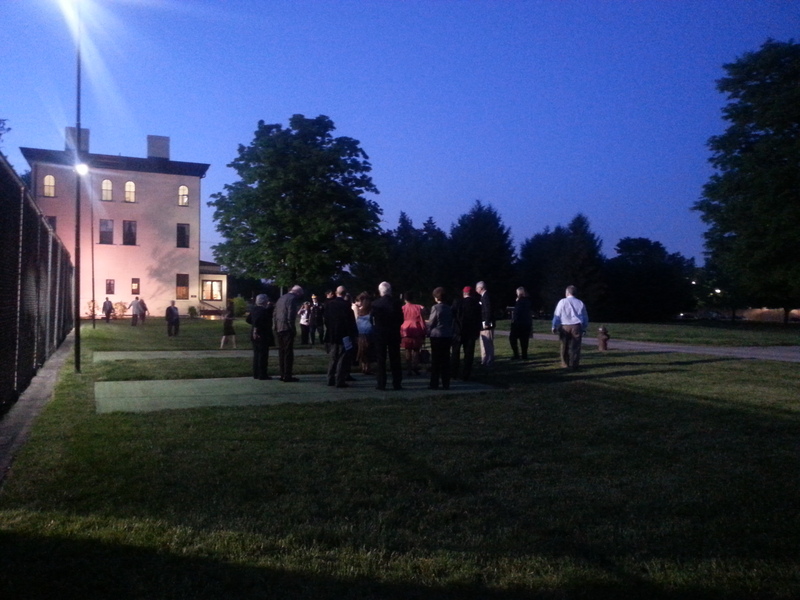 Earlier this summer, several members of the Lincoln Assassination research community were contacted and asked to assist with research for the project. Erik Jendresen (Band of Brothers), the producer/writer for the documentary was very interested in getting the story as accurate as possible. I spoke with Erik a couple of times during his research and filled him in on my area of expertise which is the incarceration and punishments of the Lincoln Conspirators. My research and writing partner John Elliott also had several conversations with him on the same subjects. During the vetting process we were asked to proof read the script and comment on areas where the facts were not always firm…which we did. All went well and about eight months later, if you watched the documentary, you saw the end result. Since the documentary aired, we have been asked how authentic the content was. Was it accurately depicted? Generally speaking, it was really good. One can always point out where the director might have taken artistic licence to move the story along or where he was forced to cut out an important part due to broadcast time restraints, but all in all, it was a fair represenation of the accepted storyline. Right now, I’m sure some of you are probably asking yourself why my answer isn’t a direct yes or no response. Was the documentary accurate or was it not? The truth is that the answer is not straightforward. Much of history is not as factual as one would like. Most can be attributed to assumptions, half truths and more often than not, some good guesses. Incorrect versions of historical events printed long ago have been repeated so often that they eventually become accepted history. In our area of research, John and I have uncovered many accepted ‘facts’ that are at best, plausible theories. There are usually not enough facts to justify these accounts as being 100% true. And in a couple of cases, we have discovered evidence of pure fraud that became accepted fact which ending up in all the history books as ‘the real deal’. Sadly, they are bogus. It is extremely difficult to ‘unteach’ an accepted point of view, especially when it has been repeated and accepted for so long. Another reason why history isn’t always a solid ‘fact or fiction’ decision is because many historians and researchers can’t agree on what the actual truth is, often resulting in even more confusion as different theories are toted and sold as the ‘one and only’ truth. When a huge two-hour documentary like Killing Lincoln appears on National Geographic, people sit up and listen. National Geographic carries a lot of clout. When I was involved with the King Tut exhibit several years ago, NatGeo was a partner in the project. Their name goes a long way. As a researcher who was asked to comment on some of the content for Killing Lincoln , I hoped the ‘truth’ (as I saw it) would be presented. In some cases, it was. In other cases, the opinions of others won out. And sometimes, when the gap between historical versions was too far apart to trust, the production seemed to resort to presenting their own carefully considered interpretations. So in the end, was the story accurate? In two words…..basically, yes. It was based on years of collective research from some of the most knowledgeable people in the business. It may not have been the whole truth, but Killing Lincoln gave the viewer a great starting point to begin doing their own research in hopes of finding the missing pieces. I’m proud to have been asked to do my small part for the production and I hope that my input helped in some way. As a reward, National Geographic posted my name under ‘Special Thanks’ in the end credits. I didn’t ask for this so it meant a lot. It is my first National Geographic documentary creditation. Let’s hope that it is not my last. LOL. Robert Redford’s film “The Conspirator” hits theaters this Friday, April 15. The producers of the film (American Film Co.) were kind enough to allow me to visit the set for a couple of days in November 2009. I later had a chance to view the film at the World Premiere showing at the Toronto Film Festival. I posted a review of the film on September 18, 2010 on this blog and later published it in the spring edition of the Lincoln Herald. I am posting that review again here today. I encourage you to see the film. For those of you who believe it is the story of Mary Surratt, the lone woman indicted with seven other defendants for their involvement in the assassination of President Abraham Lincoln, it is only partially that. This is the story of one of Mrs. Surratt’s lawyers, Frederick Aiken and his battle with the very one-sided military commission that tried her. Whether Mary Surratt was guilty or innocent is not resolved here and the debate goes on between researchers and historians as to the level of her involvement in the crime. In the end, Mary Surratt was found guilty and received the sentence of death which was carried out by hanging on July 7, 1865. Last week on September 11, I attended the world premiere of Robert Redford’s The Conspirator at the Toronto International Film Festival. The film tells the little-known story of the unjust military trial of Mary Surratt, one of eight people put on trial for conspiring to assassinate Abraham Lincoln and other members of his cabinet. Attending the gala was director Robert Redford, writer Jim Solomon and actors Robin Wright (Mary Surratt), James McAvoy (Frederick Aiken), Kevin Kline (Edwin Stanton), Justin Long (Nicholas Baker, Aiken’s life-long friend), Alexis Bledel (Sarah Weston, Aiken’s fiancee) and James Badge Dale (William Hamilton, another friend of Aiken). I am not a movie critic so I won’t be writing this article with that as my motive. For this story, I am wearing two hats; one as a researcher who knows the subject matter and the other is to share my personal impressions of the film! “So the film, seeking a distributor here, is very much a tough sell. It’s an admirable film, mixing history few people know with several real-life personalities well worth knowing. Unfortunately, viewers for such fare are older and less prone to line up on a first weekend. A distributor will need to roll this film out incrementally, looking for feature stories, reviews and word-of-mouth to entice history buffs and the curious into adult venues”. According to Kurt Graver of The American Film Company, Lionsgate and Roadside Attractions has signed on as the distributor for the film and will release it sometime in the spring of 2011. http://www.theamericanfilmcompany.com/about/news/. Generally speaking, the portrayal is factual, but there are parts that take bold stances where history may not fully support them, so I can imagine that some great debates will result. Here are three that will make you either clap or cringe! 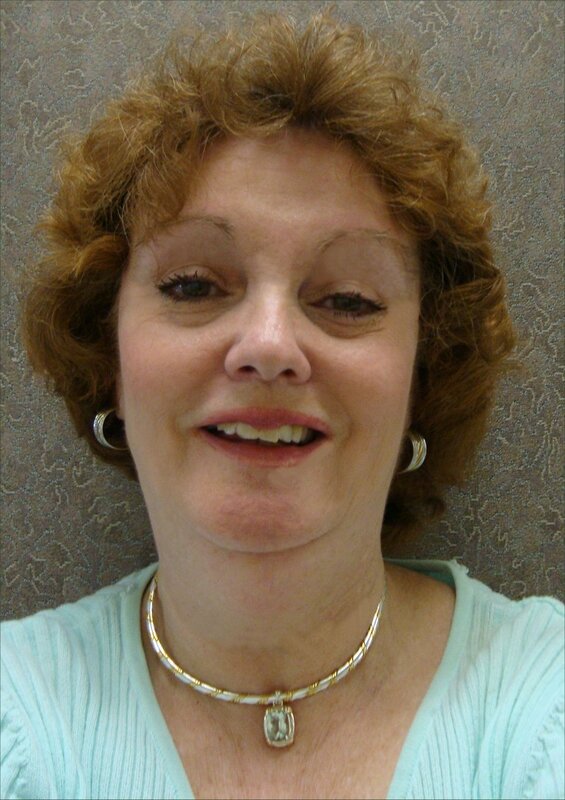 — In her first scene, Mary Surratt is incarcerated in chains, forced to wear a 75-pound ball and chain on her ankles and a pair of Lilly Irons on her wrists. CRINGE…BUT VERY LIKELY. Senior officers and her own legal council (Clampitt) stated that Mary Surratt was never chained, restrained or manacled (except during her execution). However, numerous reports from newspapers and eyewitnesses in the very early days of her trial all state seeing Mrs. Surratt wearing ankle chains and/or Lilly Irons on her wrists. Interesting! — Some factions of the Roman Catholic Church, sympathetic to the Confederate cause, have a communication pipeline between Mary Surratt and her son, John, who is in hiding in Quebec, Canada. Mary’s own priest, Father Walter, is part of that conduit. CRINGE…BUT PLAUSIBLE! The country was split with allegiances during the Civil War and the Roman Catholic Church certainly had parishioners from both Union and Confederate families. What proof is available about this scenario is not known to me, but I find the idea very intriguing. (Interesting Fact: During the spring/summer of 1865, while escaping to Montreal, Quebec, John Surratt was taken in and hidden by Father Charles Boucher and than later by Father LaPierre, both Roman Catholic priests). — After the military commission finds all eight conspirators guilty, the commission privately votes to give death sentences to Lewis Payne, David Herold and George Atzerodt. When it’s time to vote on the punishment for Mary Surratt, the vote for death is taken and a non-majority of only 3 or 4 hands out of nine are raised, resulting in a life sentence. (Note: a two-thirds majority or 6 out of 9 votes were needed for execution). Judge Holt reports the results to Edwin Stanton who states “Well, I guess we’ll just have to change their minds”. CRINGE, BUT AGAIN INTERESTING THEORY! There are no known reports on how the commission voted behind closed doors. Originally, Mary’s sentence was death. But five of the voting commission members wrote a letter to President Johnson asking for her sentence to be commuted to life. The film may misrepresent the facts a little bit but allows for this very interesting position to be tabled about whether Stanton had influence on the commission’s findings or not. The opening fifteen minutes of the film are quite engaging and successfully set the stage with just enough detail to bring the uneducated viewer up to speed quickly. Frederick Aiken as the wounded war hero and lawyer, the assassination of Lincoln, Edwin Stanton’s power and control, the other acts of conspiracy against Seward and VP Johnson, Booth’s capture/death and the rounding up of the conspirators and their imprisonment. At this point, my hopes are pretty high considering how well this complex part of the story has been simplified and told. The feel and mood are also dead on. The next hour and a half moves into the courtroom and trial scenes. I’m sure it is very difficult to create a film and display high emotion when the majority of it is in a darkened and sullen courtroom, listening to exchanges and eyewitness accounts. So was the case here. Being that I was familiar with the subject matter, there were many details that I personally found interesting. For someone new to this story, the information may be a lot to take in and understand. During the trial sequence, there are intermittent flashbacks and scenes shot outside of the courtroom. This helps to break up the trial and add details where needed. Still, some attendees at the premiere commented that the trial made the movie feel ‘flat, drawn out and stagnant on an emotional level’. Very few highs or lows in emotion are expressed during the trial other than the occasional heated exchange. It did seem to drag several times and become repetitive when the issue was made about the military commission being biased and focusing solely on getting guilty verdicts. “Okay, we got it after the first couple of times this point was made”. But the film repeats the action several more times to ensure it is not missed. Two witnesses are used (Louis Weichmann and John Lloyd) and they do a good job in burying Mary’s chances of getting out of her situation. Despite Mary’s objections, Aiken tries to make the trial about John Surratt so that he can shift the blame away from his client. From start to finish, Aiken does not accept Mary’s innocence (which was an interesting way to approach it). But he begins to fight for her when he sees how biased the commission is and railroading her and the others to a quick guilty verdict. With the law and constitution blatantly being ignored by the commission, he takes up her fight if only to prove that the law can’t be manipulated as the commission sees fit. After almost 1-1/2 hours of courtroom drama, the commission adjourns. The most exciting part of the movie could have been the last 10-15 minutes. The vote on Mary’s sentence is taken; Aiken races to get the Writ of Habeas Corpus, success and then failure when it is overturned, and the final march to the gallows. All this is covered in the last few minutes but it is rushed and appears as if the film makers ran out of time. What a shame because this really could have brought life back to the film after the slower-paced courtroom scenes. The kicker for me is the scene where Aiken has just gotten the writ on the morning of the execution and is now in Mary’s cell with Father Walter and Anna. Aiken is telling them that the writ will get her a new trial and that she is safe for now. Aiken glances out the window and notices that the scaffold still has four nooses, not three. At that moment, General Hartranft walks into the cell and informs Mary that she must come along with him to prepare for her execution. Aiken argues that he’s just obtained the writ from Judge Wylie but is then told by Hartranft that it has been suspended by the President so Mary must hang! It is the perfect moment for some serious drama (strong music, volatile conversation, some genuine emotion). There is so little of it that the ending is almost anti-climactic. Within the next three minutes of film, Mary is marched to the gallows and hanged. I was left with the feeling of “What happened”! She’s given the bum’s rush out the door, led down row of Federal soldiers, up onto the gallows and executed. A lot more could have been done to save this part of the film and make it a more attractive film to general movie goers. As I said earlier, I’m not a movie critic and have come at this from someone educated in the subject matter. So I am probably showing my own bias here. In any case, in my opinion, more could have been done with the film’s finale. A lot has been mentioned about the choice to hire Robin Wright to play Mary Surratt. I personally think she did a great job on the character. Wright portrays Mary as a devoted, unwavering mother, stoically facing her impending fate. She is assisted in interpreting the character by a great make up department, who gives Wright that familiar worn look and feel of Mary. Her youthful beauty is transformed into the comely, mother figure we have grown to know from the few photographs available. James McAvoy plays Frederick Aiken, Mary Surratt’s reluctant lawyer. McAvoy plays the character of a strong war hero who truly believes Mary Surratt is guilty of the charges against her (and never really moves from that position). However, as the military commission manipulates the court proceedings to make the trial as one-sided as possible for the prosecution, he begins to fight the injustice of it and, in doing so, almost helps to save her life in the end. Although I am not a Frederick Aiken researcher, the historical character presented seems very plausible on many levels. Kevin Kline plays Secretary of War Edwin Stanton. Although the character of Stanton is presented as a fear monger and one-man despot, Kline does a great job with him. Researchers will either cringed at, or give praise to, some of the things Stanton does in this movie (depending on how you view him in history). But for me, the actor who really steals the show has to be Tom Wilkinson as Reverdy Johnson. He is outstanding, playing Mary Surratt’s first lawyer who, after getting into a heated debate with the military commission over the constitutional legitimacy of the trial, removes himself in place of the younger, inexperienced Aiken. Mr. Wilkinson shows his talents in this film and gratefully appears throughout from start to finish. 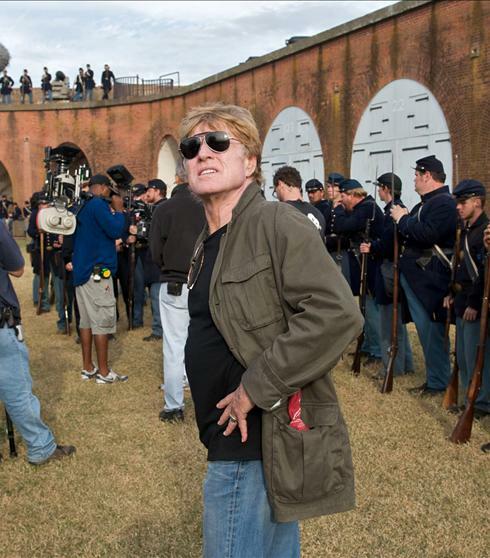 Last November, John Elliott and I were invited down to the set of The Conspirator while filming in Savannah, GA. I attended the execution sequences and John attended the trial filming. 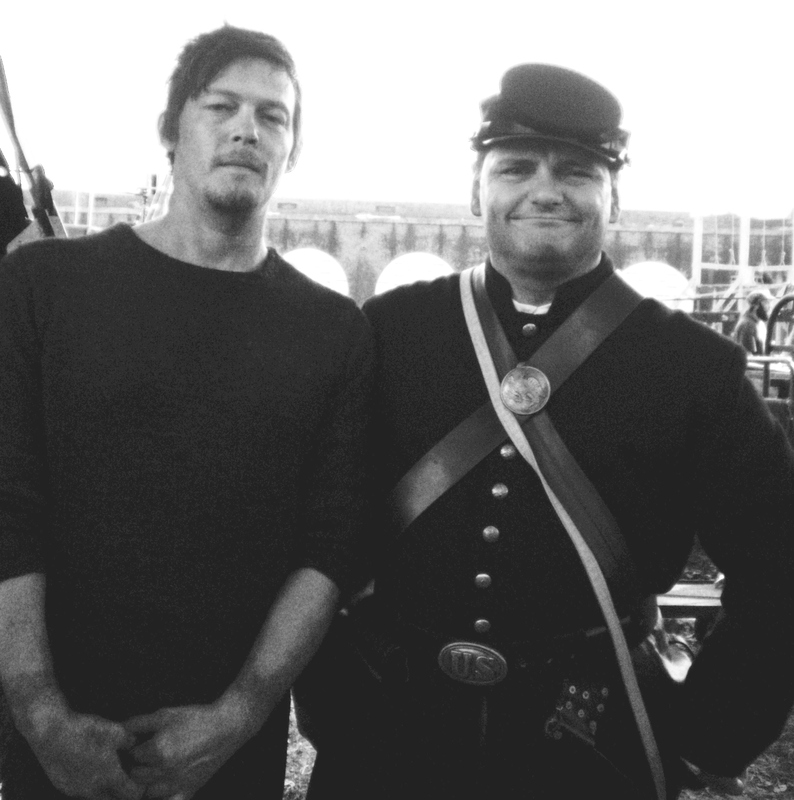 Both of us played extras as Union soldiers. I am happy to say that John made it to the big screen and can easily be seen escorting Jonathan Groff (who plays Louis Weichmann) to the stand for the first time. Congrats John on your movie debut. For me, I am buried somewhere in the background during the hanging sequence. If I am there (and not on the cutting room floor) it will take a microscopic forensic examination of the film to find myself. But hey, that is what I do! LOL. I’ve had my 15 minutes of fame years ago when I was an extra in a film called “Murder at 1600”. I made it onto the big screen as a uniformed secret service agent. Ah, those were the days! Congratulations to you John. (By the way, I can see myself in the photo used at the beginning of this article….time to play Where’s Waldo). Finally, I think if you have a working knowledge of this story you will get much more out of the film than if you are new to the subject. In any case, the film is sure to get people wondering about the ‘real story’ of the aftermath of the assassination and that is always a great thing for us in the research community. We love sharing our knowledge with you. So after saying all this, what did I think of the film? I liked it a lot. Don’t let my disappointment in the ending sway you. As always, I want to see MORE rather than less. I’m sure you’ll enjoy the film when you get your chance to see it. The executions of the four condemned Lincoln conspirators on July 7, 1865 were witnessed and told to the world through many sources. First person, eyewitness accounts taken from newspapers, private letters and people who participated in the event all shared vivid details of what occurred. In conjunction with these, photographers Alexander Gardner and his assistant Timothy O’Sullivan took ten graphic photographs of the proceedings from start to finish. Over time, a conflict arose between what was reported in the first-person, eyewitness accounts and what was visually seen in the Gardner photographs. The eyewitness evidence did not match the visual evidence. For over a century, researchers, writers, filmmakers and documentarians have wrestled with this dilemma but have never successfully found an acceptable solution. Through our research, John Elliott and I believe we have found the answer and are able to share it with you now. It is one of several discoveries we have made that will be found in our upcoming book Inside the Walls: The Final Days of the Lincoln Conspirators. We are very excited about solving this puzzle and although not earth-shattering, we humbly categorize it as a simple ‘historical adjustment’. Who Gave the Signal to Spring the Traps? is the chapter from our book where we present the resolution to this long-standing conflict involving three simple questions: Who gave the signal to spring the traps, from what location was it given from and by what method was it delivered? 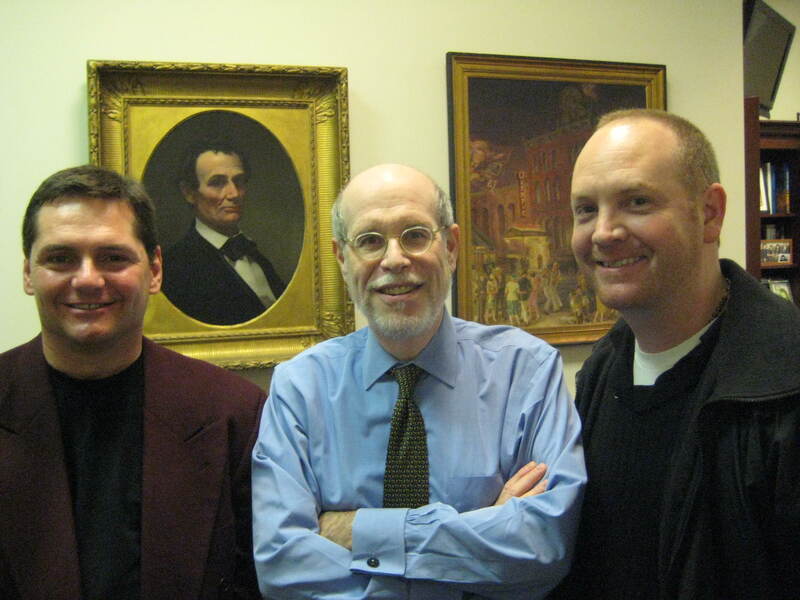 John and I held off sharing this information with you until we officially presented our findings at the Surratt Society & Surratt House Museum 2011 Conference, Lincoln Assassination: New Perspectives in Clinton, MD on March 19. This now being done, we hope you find the information interesting and look forward to hearing your feedback. [Click on the link above to read the chapter]. 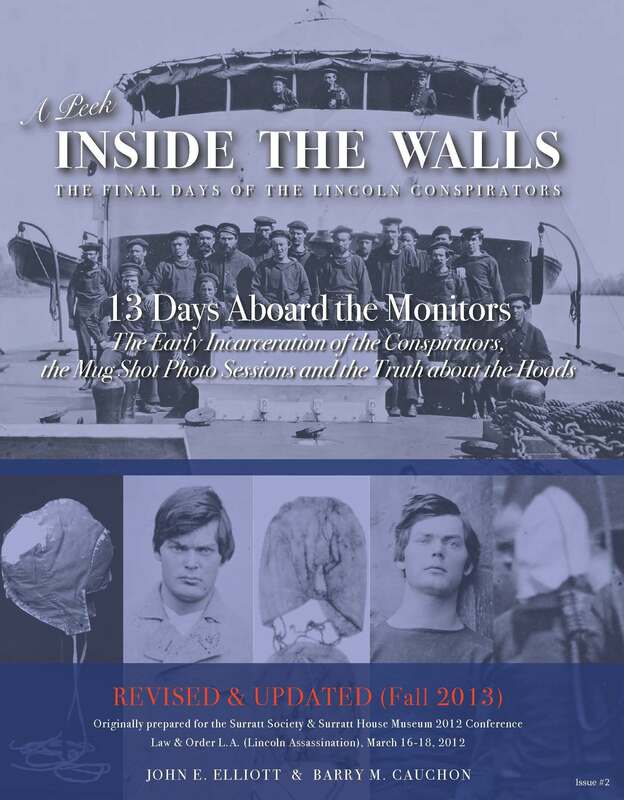 If you wish to purchase the printed supplement of this discovery under the “A Peek Inside the Walls: The Final Days of the Lincoln Conspirators”, go to the following link. 500,000 HITS … WOW … My readers are AWESOME! My good friends Ed and Mary Beth Isaacs have been tracking the progress of my blog hit counter over the past few days as they anxiously waited for it to reach the 500,000 hit mark. Because I have been so busy at work, I haven’t been able to keep an eye on it myself and they were gracious enough to offer. I can’t thank them enough. At 8:59 p.m. last night on Friday, January 28, 2011, the momentous occasion occurred. 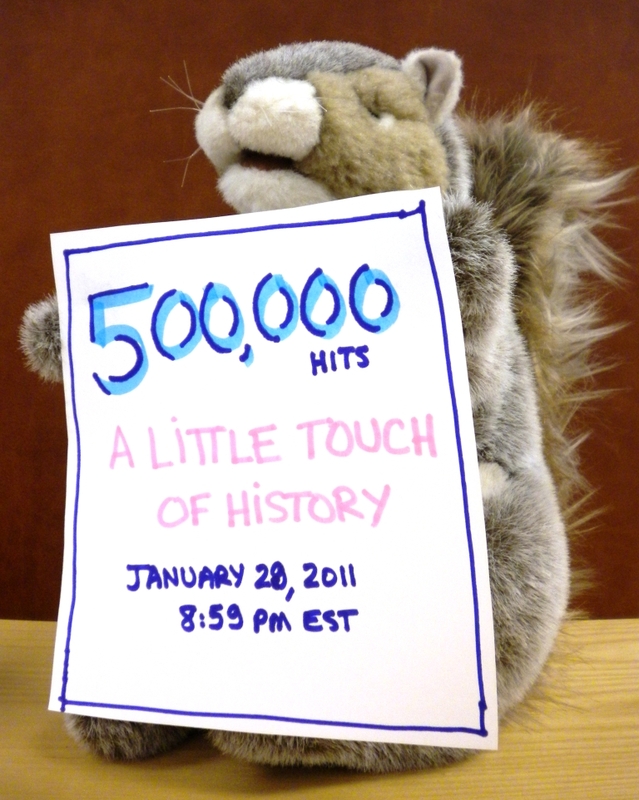 Half a million people have clicked their mouses at least once on this blog since May of 2008 and all I can say is “Wow. I’m touched. I’m amazed. I’m humbled. For those of you who personally know me, you will understand that I speak from the heart when I say, “I really am overwhelmed”! I started writing this little blog about three years ago just to share my love of history with others. I had no motive other than to see if I could connect with similar-minded individuals and students who were interested in the same subjects as I. I had no idea where this would take me. Yes folks, this is the “feel good” story of the year, so read on…lol. In the course of this blog’s life, I have met researchers, writers, scholars, historians, museum curators, war veterans, authors, film makers, directors, actors, legislators, politicians, history buffs, teachers and students… just to name a few. However, I have also met, and have been befriended by, many wonderful people just wanting to offer their personal family stories to me. Some have become good friends. My life has been enriched by them and the experiences they’ve allowed me to share in. Their persistent and unfaltering encouragement has also kept me moving forward on my projects when there were days I felt like I didn’t have anything left to give. For that, I am truly blessed. This year, two important things will occur for me. 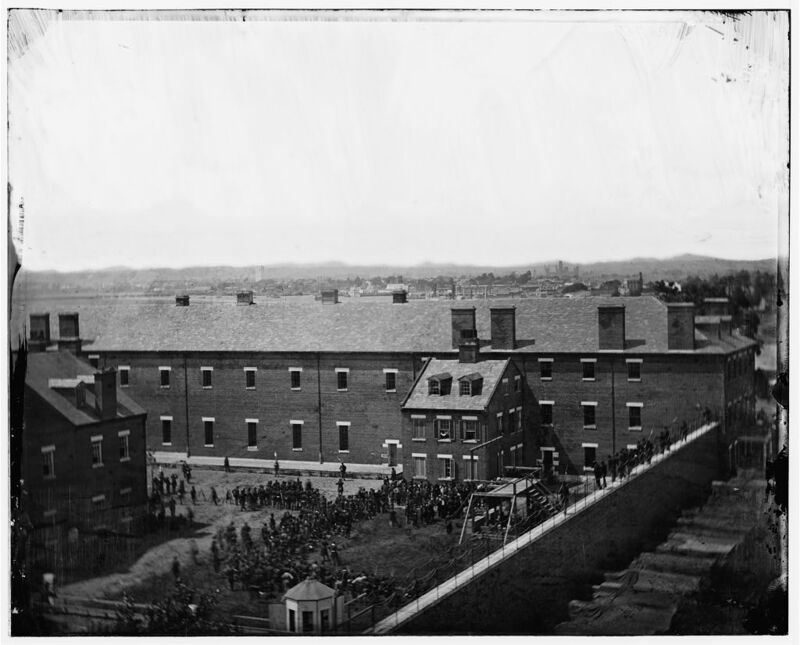 John Elliott (my writing partner) and I will complete and publish our book on the Arsenal Penitentiary called “Inside the Walls: The Final Days of the Lincoln Conspirators. As well, we will present our work publicly for the first time to our peers and conference attendees at the Surratt Society 12th Annual Assassination Conference in March. I will meet many of my new-found friends at the conference (some of whom I’ve never had the pleasure to meet in person). I am truly looking forward to it. After those two milestones are met, I have other goals that I hope to begin working on in the latter half of 2011. The first will be to get back to posting new articles on this blog. As many of you have noticed, 2010 and 2011 really saw a decline in my output. That is because writing a book, and working for a living, took a lot of my limited time. So expect to see new articles, and perhaps, even a change in how I present the work, sometime after March when things should start to free up a bit. I may even refresh the look of the blog…just thinking out loud here. The second will be to start working with students and educational institutions again. I love speaking to students and sharing historically based information that is not always found in the curriculum. This year I want to visit more schools and meet more students and their teachers. I suppose it is my way of ‘giving back’ but I also enjoy the experience very much. Education is very important to me. If I can play a small part in helping even one student succeed, then I plan to make that a priority in my goals of the future. Again, thank you all for your support and friendship. I look forward to moving ahead in the coming months and sharing more interesting history with you. Hi all: This is just a quick note to everyone who signed up for our ITW Book Update. Yesterday, we issued the update by email from outreach@awesometalks.com with the PDF attachment. It was sent out to everyone who had signed up for our Update Mailing List. Some emails were rejected as they are outdated or no longer valid. If you did not receive this mailing or wish to be added to our mailing list, please send me a quick note at outreach@awesometalks.com with BOOK in the subject title and I’ll send the update to you as soon as possible. 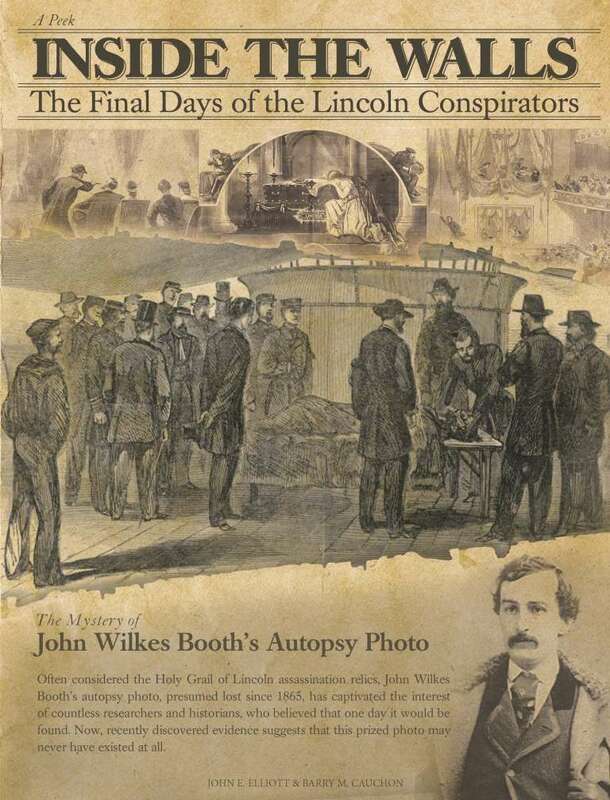 By Monday, October 11, John Elliott and I will be emailing out a long awaited update on our book called Inside the Walls: The Final Days of the Lincoln Conspirators. Over the past year, many of my great followers from here, and from our Facebook page, have signed up for these updates. We have collected quite a large list and are now ready to share our progress with you. There is a lot of new stuff to report. Least of which is that John has created a new website (yet to be built) dedicated to Inside the Walls. We both have new email addresses which we will share with you in the update letter. My current blog email at outreach@awesometalks.com will still remain active however. It has been a few months since our last update so you haven’t missed anything recently. These detailed updates are only shared with those who have requested them by email. If you are not on our ITW Book Update List and wish to receive updates, please send an email at outreach@awesometalks.com with “BOOK” in the subject line. Leave your email address, and name if you like, and I’ll be sure to include you. This list is strictly used for our own purposes and will not be shared with others. If you believe you are already on the list but don’t receive the update by October 11, please write me again so I can forward it to you. John and I are both humbled and grateful for the tremendous interest shown in our book. As well, we cannot begin to thank the numerous members of the Lincoln Research Community who have shared parts of their own research and knowledge with us. Their encouragement and involvement with this project have been nothing short of amazing. They have given us the material needed to bring the content of our book to a level we never imagined a year ago. I can assure you that our dedication page will be a lengthy one. We look forward to updating you. STATE YOUR CASE (No. 2): How did John Wilkes Booth Break his Leg? Subject: How did John Wilkes Booth Break his Leg? Proposition: The story of John Wilkes Booth and the assassination of Abraham Lincoln is known to most Americans. However, there is one aspect of the story that is not as clear cut as some might believe. How did John Wilkes Booth break his leg (fibula bone) during his escape from Ford’s Theatre after shooting President Lincoln? Some of the most respected Lincoln assassination researchers and authors sit on opposite sides of the fence when it comes to this question. 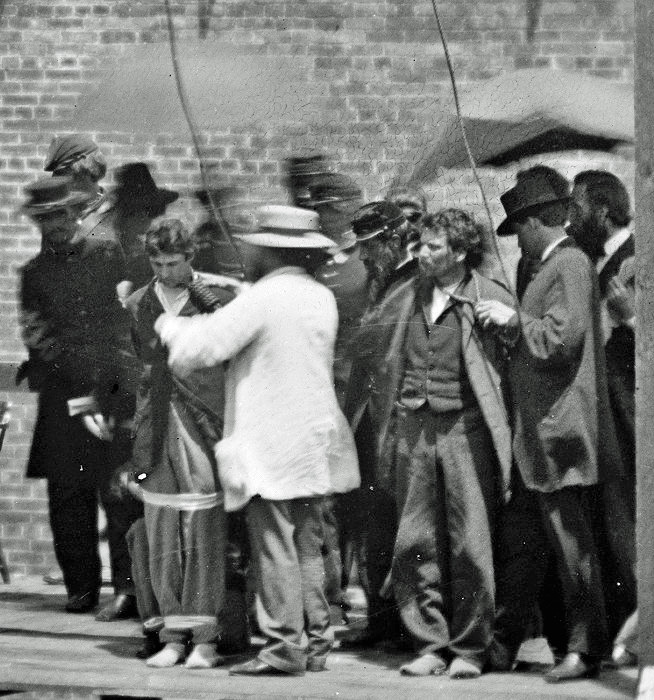 The more common belief is that Booth broke his leg after jumping from the Lincolns’ box and landing awkwardly on the stage below. However, a second theory, which is not new, is that Booth’s injury occurred in a horse accident sometime during his escape that night. According to this theory, Booth’s horse fell on him. John Elliott, Lincoln assassination researcher, will present his reasons why he believes that the latter theory, the horse accident, is the correct one. 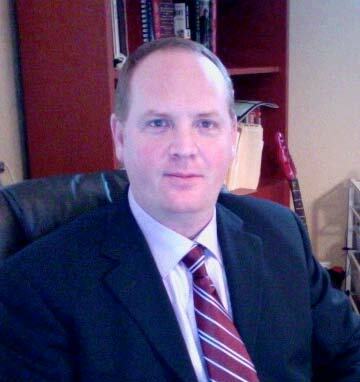 Please review Mr. Elliott’s material by clicking on the RED link below. When finished, please offer your critique in the comments section at the bottom of this page. Note: If you are on the main page of the blog, the comment section is not there. Click on the headline for this posting and it will take you to that page where the comment section is. DISCLAIMER: A Little Touch of History does not endorse or challenge the validity of the content presented here. The theories are published here solely for the purpose of giving aspiring researchers a place to present. I will not be taking sides or giving any personal comments publicly on their subjects. The authors have confirmed that the work is their own, and in publishing it here, take sole responsibility for any claims made. Thank you to all of you who have visited my blog over the last couple of years. As those of you following my work know, I am currently in the middle of writing a book with my writing partner John Elliott as well as possibly turning it into a documentary. When things happen fast, you need to go with the flow. So due to this, my blog output has ground to a crawl and for that I apologize. However, when I find something that is historically interesting, or those that have great information find me, I like to pass it along to you as fast as I can. Case in point is a website about the Hindenburg and the other great airships of the 20’s and 30’s. The site is run by Dan Grossman out of Atlanta, Georgia and he wrote the following note to me regarding an article I authored called “D-LZ 129 HINDENBURG . . . JUST THE FACTS, MA’AM”!”. “Barry. You have done a great job of presenting the basic facts about the Hindenburg for people who want a short, accurate summary. But for readers who want more information (photos, deck plans, flight schedules, flight operations, etc. ), would you be willing to post a link to: http://www.airships.net/hindenburg at the end of your posting, for people who might not read all the comments? As the Hindenburg and the other great airships are not my specialty, but still hold wonderful historical interest for me, I recommend Dan’s website for those wanting to know much more about this subject. Dan, thanks for your kind words and offers of assistance. Join us at INSIDE THE WALLS on Facebook!!! My writing partner John Elliott and I are producing a book (and possibly a documentary)on the Lincoln conspirators and their experiences inside the walls of the various prisons (in particular, the Old Arsenal Penitentiary) where they were held before, during and after their trial. As you know, some of the conspirators were hanged almost immediately after the trial ended while others were sent away to Fort Jefferson in the Dry Tortugas (off the Florida Keys) to serve out their sentences. Our book will not only cover these elements of the story but also include the forensic study of the ten Alexander Gardner photos that were taken of the executions on July 7, 1865. Plus much much more. We wanted to let you know that we have now set up a page on Facebook called INSIDE THE WALLS which we encourage you to join as fans. It will allow you to keep up to date on what is happening with our project(s), ask questions or join into our Discussion Board. Just sign into Facebook and then search for Inside the Walls. When you get there, join up as a FAN and you are in. We look forward to seeing you there. Note, as some folks are not comfortable being on Facebook but still want to be kept informed of our progress, please send me an email at outreach@awesometalks.com with your name and email address. In the subject line write the word BOOK and I will add you to this update list. We look forward to seeing you on INSIDE THE WALLS and talking to you about the Lincoln conspiracy. We want to hear what you have to say so please tell us your thoughts and ask any questions you may have. If we don’t know the answer, we’ll do our best to find out as soon as possible. MR. P’s PHOTOGRAPH IS AN ORIGINAL!!!! Hi all: On Friday, November 19, I had the honor to Mr. Harold Holzer at his office in NYC. We have corresponded and spoken on the phone for over a year and it was great to finally meet him face-to-face. Although the main reason for our meeting is not the subject of this posting, we resolved a puzzle that has been on my mind for over a year. 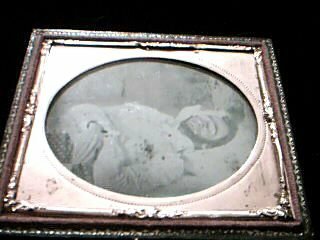 As some of my dedicated readers may remember, in August of 2008, I posted a photograph on my blog from a person I referred to as Mr. P.
Mr. P. owns a photograph in a Victorian frame which he believed was one of Lincoln in death. I posted it on the blog asking anyone who might want to comment on it. In less than a week, I received an email from Harold Holzer stating that the photograph was not one of Lincoln in death. 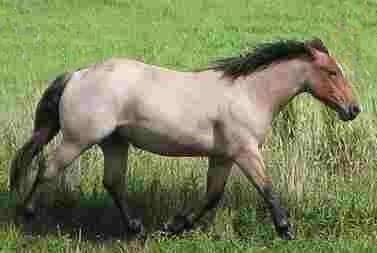 Instead it was an existing image considered to be a fake or spurious one. It had been previously published in books in the early 1960’s. And that was that. 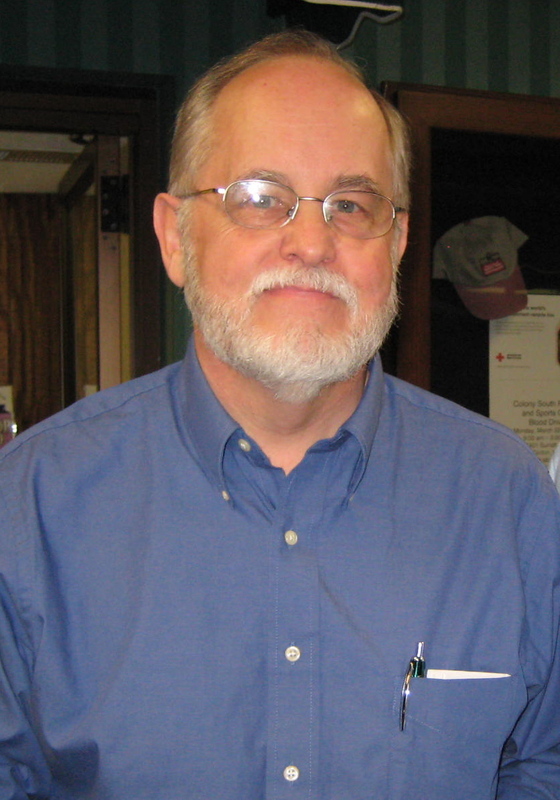 I published Mr. Holzer’s findings on August 21, 2008 and informed Mr. P. about the results. 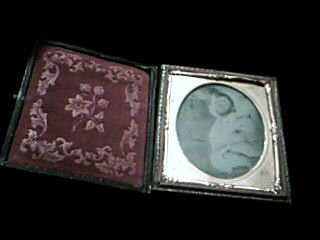 But we still wondered about the Victorian framed photograph and how Mr. P’s family came to have this piece. 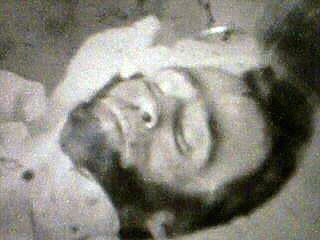 Who was this man? What type of photographic process was used? Was it a printed copy or an original? We just didn’t know and didn’t dare open it without help. We zip ahead to last week. A lot has changed in one year. Mr. P. is now one of my closest friends. 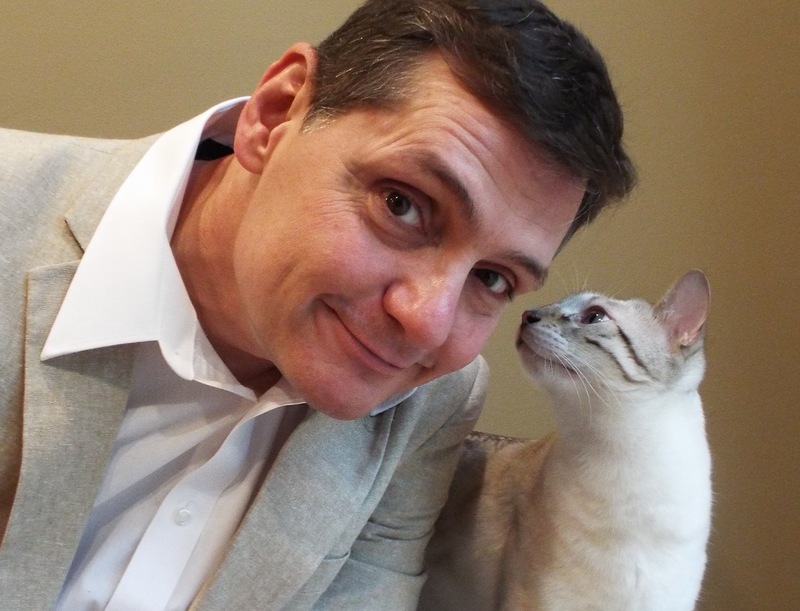 I’ve partnered with John Elliott to be my writing partner and are moving ahead with our book and other projects. So we all meet in NYC and descend upon the office of Harold Holzer at the Metropolitan Museum of Art. After our scheduled meeting with Mr. Holzer, Mr. P. brought out the photograph and we asked if Mr. Holzer would look at it. Since it was this photo that brought all of us together, we thought it was appropriate to have him be the one to look at it. Upon inspection, Mr. Holzer opened the frame to expose the photograph. 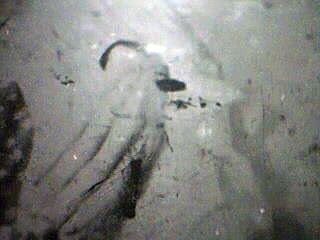 Once apart, we observed that the image was printed on a glass plate. Mr. Holzer indicated that it was an Ambrotype which was a photographic process used in the early 1800s. And as this was an Ambrotype it meant that the photograph was an original and not a reproduction. AMAZING! This photo, which has been published in numerous Lincoln books, is the original Ambrotype from which these reproduced photos were made. We were all very excited about the confirmation. Thank you Mr. Holzer for a great meeting and the photographic identification. So even though the image is not that of Abraham Lincoln in death and is considered a fake, at least now we know that Mr. P. owns the original fake. Below is part of the original article that was written over a year ago that started this whole train moving down the track. Hi all: My blog has had a flurry of activity recently concerning several articles that I had posted on questionable Lincoln Photos in Death. I was honored to be contacted by Mr. Harold Holzer, the Senior Vice President, External Affairs from the Metropolitan Museum of Art in NYC. Mr. Holzer is an historian and author, considered to be one of the leading Lincoln scholars in the world and he graciously offered to comment on the photos I have been debating here. This is the first time we are publishing this photograph here. We were going to wait until September 3, 2008 however the review by Mr. Holzer allows us to post it now. The arms and chest are too narrow. When the doctors removed Lincoln’s shirt after he was shot, they notice his chest and arms were very muscular. He was ‘ripped’. The body in these photos is not. All of these were valid points, but the best was still to come! The photo is not a new image. Mr. Holzer pointed out that he had seen it before in Charles Hamilton and Lloyd Ostendorf’s 1963 book, “Lincoln in Photographs: An Album of Every Known Pose”, 1st edition, on page 294. 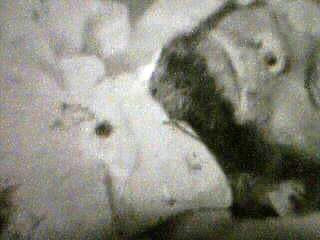 Mr. Holzer stated, “It seems to me they are one and the same shot with the alleged deathbed photo Lloyd Ostendorf and Charles Hamilton published as a spurious image in their 1963 “Lincoln in Photographs,” p 294. I don’t disagree with their conclusions—the beard is simply wrong. Lincoln may have had a sort of full beard for his February 1865 life mask, but as the March inaugural photos and the Henry Warren photos show the next day (not to mention the known photo of Lincoln in his coffin), his beard had been considerably trimmed down by the spring of that year”. After conversing with Mr. Holzer on several points for clarification, I was able to find the same photo (although reversed) in another book call “Twenty Days” by Dorthy Meserve Kunhardt & Philip Kunhardt, Jr., Harper & Rowe Publishers, NY, 1965 (see photo and link below). It looks like the exact same photo! Identical photo (in reverse) from book “Twenty Days” by Dorthy Meserve Kunhardt. CONCLUSION: The image is unlikely that of Mr. Lincoln based on the information presented here. But it does raise several questions about who it really is and the origin of the image itself. Assuming that Mr. P. has an original Daguerreotype or tintype of this image, how did it end up in several books in the 1960s? Mr. P. found the photograph in a desk that his grandmother left to him when she died. This was about 25 years ago. The printed images have been in the public eye for at least 45 years! Does Mr. P. have the original or is it a copy? Was there more than one image made of the body at the time the photograph was shot? Who is the man? Could it be one of Mr. P’s relatives? Mr. Holzer believes that the photo could be from the 1840s or 50s. Where did Charles Hamilton and Lloyd Ostendorf get the original photo for their book? What is the history of the picture? FOLLOW UP: Mr. P is not disappointed that his photo was not Mr. Lincoln. He is actually thrilled that he owns a genuine ‘fake’ now. And it has given him a new area of research to investigate. History can be exciting, even if it isn’t on the ‘main stage’. Keep hunting Mr. P! THANK YOU: Finally, I want to personally thank Mr. Harold Holzer for his time and efforts in helping me assist Mr. P in this project. As well, I’d like to also thank Kevin O. Johnson, Ph.D in Dallas, Christy and Tins (pardijoe) for offering their comments, direction and assistance in solving the puzzle as well. Many many many thanks to all of you.